In a number of Buddhist- majority states in Asia- Burma (Myanmar), Thailand, Sri Lanka, Cambodia, etc. -the Muslim minorities are under siege. Both the State agencies and the Buddhist chauvinists are driving the anti-Muslim hate campaigns and consequent violence against the hapless minorities. The unspeakable horrors committed by the Buddhist marauders against the Rohingya Muslims of Burma have caught international attention in the recent months. 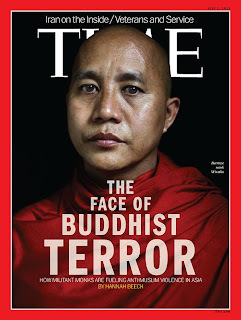 In the latest issue of the international newsweekly Time Magazine of the United States, one may read a graphic portrait of Buddhist Terrorism in Burma and Thailand, where a Muslim-majority province in the deep south of the country is under siege of the Buddhist army of Thailand. Sri Lanka on Tuesday (July 02, 2013) banned the sale of this issue of Time magazine because of the newsweekly’s feature article on Buddhist terrorism. 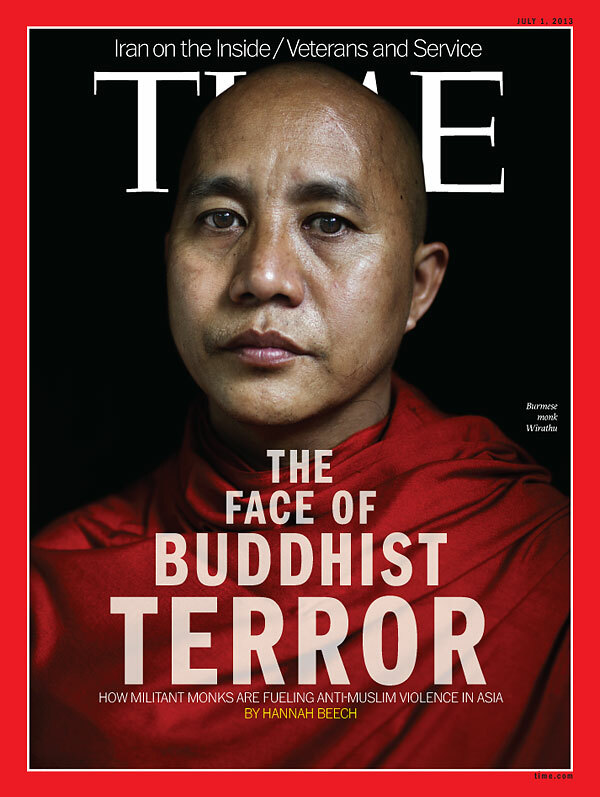 We publish below the Full text of the cover story “The Face of Buddhist Terror” in July 01, 2013 TIME magazine. Islam values freedom of expression and association, of belief and faith, of worship and practice as a primary condition of community life in a decent society. It also recognizes that ruling oligarchies and power elites may reject these fundamental freedoms of people and even persecute people on the grounds of their deeply-held spiritual convictions. Indeed, Islam emerged in a society where polytheists and image-worshippers were persecuting people on the grounds of their beliefs. With relentless persecution in society, the early Muslims in Makkah had no option but to migrate to Medina along with the Holy Prophet of Islam Hadhrat Muhammad (sa). In Islamic tradition, this incident is of historic importance as the Hijrah. According to the Holy Qur’an, migration (Hijrah) is an option for all those who suffer religious intolerance, or other forms of oppression and persecution. To escape from persecution, Divine Messengers and their followers in the past had undertaken migration from their land and sought freedom in exile. ‘I will emigrate for the sake of my Lord’, (29:26; 37:99) declared Hadhrat Ibrahim (as) when threatened by his own people. Hadhrat Musa (as) and the Israelites had to flee the oppression of the Pharaoh: ‘So he escaped from there, vigilant and fearing for his life, and said “My Lord, deliver me from these oppressors”’ (28:21). In his Friday Sermon of 21 June 2013, the Khalifatullah Hadhrat Munir Ahmad Azim Sahib (atba) of Mauritius provides illuminating insights on the larger spiritual essence of the idea of Hijrah in the everyday lives of the believers and Divine seekers. 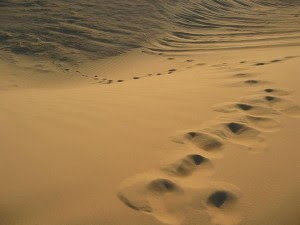 Beyond the actual physical migration from an oppressive place, Hijrah entails a commitment to consciously leave aside all illicit acts/dealings arising out of Hubb-ud-Duniya or love of this temporal world and to perform and embrace all religious/ethical obligations and Divine commandments, keeping in mind the journey to the Hereafter (Aakhirat), under the guidance of a Spiritual Master that Islam provides in every age. One of the most dangerous of human vices is lying. Much damage may be inflicted in human relations through the spread of lies and falsehoods. Prudence demands that we be cautious and careful in how we deploy our tongue so as to avoid injury and damage to others. In his Friday Sermon of June 28, 2013 the Khalifatullah Hadhrat Munir Ahmad Azim Sahib (atba) of Mauritius gave a profound discourse on the wisdom of silence by drawing upon the sacred traditions of the Holy Prophet of Islam (sa).